IIPM: Mocking at Quality of Indian Higher Education? IIPM and Arindam Chaudhuri have been synonymous with advertisements shouting “Dare to think beyond the IIMs!” (Here is Hoot’s analysis on IIPM’s advertisements). It took audacity (often to the limit of brashness) and entrepreneurial grit to equate oneself with big brands like IIMs. IIPM enrolls more than 5000 students across 8 campuses with more than 400 faculty members. So, what’s the issue? 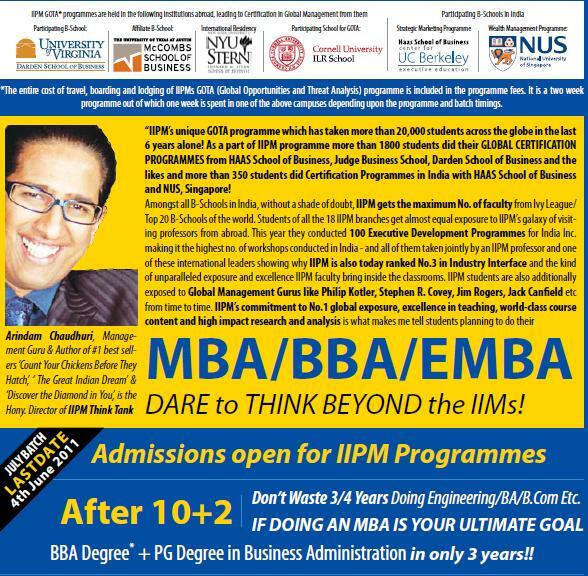 The issue is better understood if you see the advertisements of IIPM like below. What’s the brand “promise” to a prospective student? They are most likely to see “MBA/BBA/EMBA” along with major brands like Cornell and Stern. “1. Does AICTE/UGC [Indian regulatory bodies] recognize IIPMs programme in planning and entrepreneurship? No. IIPM has never sought recognition from any statutory bodies and is proud of its world class course contents. Students bothered about statutory recognition of IIPMs programmes need not apply to IIPM…. This disconnect and misrepresentation comes at a huge price to students (In fact, someone has started a website called IIPM is a scam!). IIPM’s approach also made some leading brands like Stanford to issue a letter about IIPM’s false claims. IIPM is also a classic case of how slow and toothless higher education quality assurance system in India is. Based on complaints, UGC expressed concerns in 2005 and then again in 2010, however, IIPM continues to grow using it’s tried and tested method of advertising and ignoring regulation. “The University Grants Commission is not happy with the Indian Institute of Planning and Management offering an MBA degree. UGC says no institute in the country can offer a degree course without its approval and IIPM does not have its go ahead. More recently, Siddhartha Deb wrote an incisive article “Sweet Smell of Success: How Arindam Chaudhuri Made a Fortune Off the Aspirations—and Insecurities—of India’s Middle Classes.” (I can’t even provide the link to the article as court has ordered to remove the article). Of course, Dean Chaudhuri did not like it and sued the author, magazine and Google (yes, you read it right–Google) for defamation. Here is the press release by Caravan magazine which published Deb’s article and has been sued by IIPM. Interestingly, there are many more unrecognized institutions in India. According to a government response, AICTE and UGC have received 101 and 23 complaints respectively about alleged malpractices. We still remember the fuss and attention Tri Valley scam in the US received , however, there are many Tri Valley’s in India and nothing is being done. At least, in the case of TVU, it is now defunct, while Indian regulation is restricted to paperwork and rhetoric. In March 2010, “The Prohibition of Unfair Practices” bill was approved by the Cabinet, however it is yet to be approved by the Parliament. Is IIPM misleading students or offering a unique choice? Is Arindam Chauduri an inspiration or disgrace for education fraternity including faculty and entrepreneurs? What does it say about Indian quality assurance environment? Why worry about foreign universities bill when one can always work-around it? If you are a foreign university looking for collaborations in India, how do you distinguish between “recognized” and “unrecognized” institutions? What are the implications for your institutional brand? How does one distinguish between institutions like ISB and IIPM when both are not recognized by AICTE? (ISB is ranked #12 in Financial Times). What brand risk a foreign institution is assuming in forging partnerships? This is one issue on which I have more questions than answers. Any thoughts/comments/answers? IIPM: Best only in claims? IIPM is not the only one there are universities like JJT University (http://jjtu.ac.in) that registers only Ph.D. candidates in all branches of engineering and management and have collected several crores of Rupees from thousands of aspirants who are desperately looking for a doctorate to fulfill AICTE / UGC norms for furthering their career in academic. The most shameful part is that JJT University been awarded an authentic University status by a public notice issued by the University Grants Commission on State Private Universities. Notwithstanding, JJTU has no academic infrastructure, no faculty, no professor, no students, no guide, no library, no laboratory ……… with its infrastructure like a low-budget guest-house at a remote backward village in Rajasthan where the campus is managed by few Clerks and a dummy Vice-Chancellor. It seems that State Government / UGC has granted University status to JJTU only for pulling out money by luring candidates for authenticated (off-campus) Ph.D. degrees at their doorsteps. Thumbs up on this super post, Rahul! IIPM and its ilk use a simple strategy: shout from the rooftops and mislead, amass enrollments amidst the confusion, build up numbers, then take forward a longer term agenda (such as affiliation or accreditation). Recognition should not be a criterion for quality. It is a qualifier. But many private institutions, accredited / affiliated or not, spend unbelievable amounts on publicity–often in an attempt to allay or obfuscate parents'fears about job prospects–and not enough on quality-building. You raise an excellent question around the Indian higher education quality assurance process. Institutes likes IIPM don't even bother or think or it as necessary to get UGC approval, but even the institutes that do seek and get this approval are no better. The manner in which private universities are being approved by State Governments and UGC is an ominous sign and does not portend well for the future growth of University education in India. There is clearly a need for both State Governments and UGC to take this issue more seriously. UGC in particular has constitutional responsibility for maintaining standards of education in the country and they should not shy away from discharging it. Also students should be more cognizant while taking admissions in these institutes and maybe visits these schools and try and get as much information as possible before enrolling in them. I have been following the IIPM and caravan issue since past few days, would like to point out to you that IIPM has had a history of silencing its critics,earlier Rashmi bansal the author of http://youthcurry.blogspot.com/ and editor of JAM magzine (alumni of IIM A) and gaurav sabnis (gauravsabnis.blogspot.com/), IIM Luckhnow alumnus were sued for outrageous amounts of money by IIPM for publishing so called "defamatory" articles. And that was not all, what followed was a massive disgusting & sickening online campaign launched by IIPM students and management of attacking the character and credibility of these individuals. The way followed by IIPM has been of bullying and extortion to silence all its critics and exploiting the indian legal system in creating a situation that it becomes financial unviable for critics to raise their voice. the hullabaloo over IIPM caravan debacle shows the level to which IIPM management can stoop in its quest to make money and fool the gullible students. the question that one needs to ask is whether any company wants management graduates from institutes which do not understand the E of ethics. It is really a question that we need to ask ourselves that can we keep in ignoring such bullying behaviour from financially powerful organizations like IIPM. even Media has been a silent spectator in this debacle as IIPM is a massive advertiser in popular media houses like times of india and the hindu. I believe that such events are only the symptoms of a deep and worrying underlying problem in the Indian legal and education system, which are profitably utilized by institutes like IIPM. For an effective value and recognition of the degree, one should always go for online degrees with proper accreditation. There are educational accreditation boards in each country, that the education system of the country with the aim to regulate an acceptable level of quality of education from different institutions. students should be more cognizant while taking admissions in these institutes and maybe visits these schools and try and get as much information as possible before enrolling in them. If a person is already set in job in a industry, Is it ok to go for part time PhD in pharmacy with university like jjtu(jagdishprasad jhabarmal tiberwala university), rajasthan? Is it having UGC approval indeed? Is iipm ugc recognised r nt?